I watched her run a marathon in 1994. (Yes, I’m that old.) Recalling that, this past year I decided to give it a go myself — something to check off my bucket list. I will admit it wasn’t easy — I didn’t have the help of professionals and the support of a nation like Oprah did. But I did it. 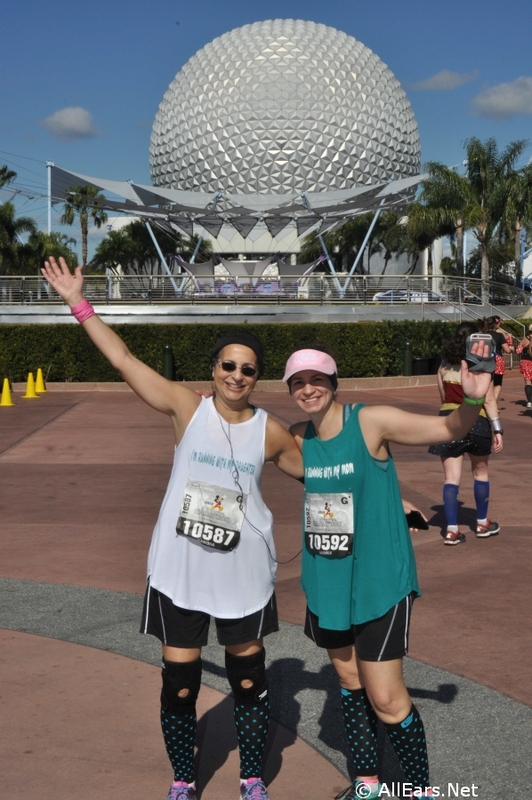 I ran the 25th Anniversary Disney Marathon earlier this year. And if I can do it, so can you! Based on that experience, here are some tips and answers to questions that I had that aren’t on the runDisney website. My first tip is to find a running buddy. I “recruited” my daughter, who said yes but went on record at the time that she didn’t think running a marathon was a good idea. She works full time and has three small children. Neither of us would be considered elite athletes. I was doing Zumba (well, trying to do Zumba) and she was occasionally using her elliptical machine (no, not just to hang clothes on). Next, check out the runDisney site. They have training guides and tips from Jeff Galloway, instructions on how to register, prices — most of the information that you need. I’ll be honest, we didn’t have that much time to commit to running Galloway’s program. But we weren’t interested in our time. We just wanted to finish the marathon. We didn’t want to see any balloon ladies. “What’s a balloon lady?” you ask. They are the ladies who leave the start line last. They maintain a 16-minute mile pace. If they pass you, you’re in for a bus ride to the finish line. You don’t want all that time spent on training not to pay off, so you hope you don’t see them. Also note that the 16-minute mile pace begins when the last person crosses the start line. Keeping that in mind, you may want to do an “official” 10-mile or half marathon race ahead of time and turn in your results. You will be placed in a corral further toward the front. Why? Because you’ll have a head start. Imagine getting three or so miles in before your 16-minute mile pace begins. We did not do this because we didn’t have the time and I didn’t feel we were ready to run a half-marathon in October. So we started in our assigned corral “G”. There was one corral behind us so we still had a head start, but not much. The corrals had LOTS of people in them so Disney divided them up in waves. Try to get to your assigned corral early and get as close to the front of your corral as you can. If you’re in wave 1 (or 2 like us), you’ll have that much more of a head start. There was only one corral behind us, but since we were in the second wave of our corral, technically there were six corrals behind us (two more of “G” and four of “H”). After all the people from a “wave” leave, Disney waits a minute to release the next group. And every group gets sent off with fireworks… It’s really pretty cool, but it takes a long time, so make sure to hit the bathroom before heading to your corral. Let’s talk bathrooms. There are real bathrooms in each park and plenty of port-a-potties. Lines form no matter which you decide to use, but if you go with the port-a-potties, I suggest you invest in pee pockets (if you’re female). I bought some cardboard ones and they fit in my pocket that I sewed on my running shorts. Also, invest in a waist pack. Mine had two water bottles (one for each of us) and a zipper in the middle that fit bandages, KT tape, and my phone. It comes in handy for training, too. This is my opinion only, but I don’t see how anyone could run, or attempt to power-walk, a marathon without training. If you don’t follow the model on the runDisney website, I strongly suggest you make sure to take several long runs. I could run five miles with no problems, but on the 10 and 13-mile runs my knees started to bother me. I invested in knee braces, which helped me immensely. My daughter had hip flexor pain so we found a Youtube video on how to use KT tape for that. I also taped the arch of my foot and we had to try several sneakers to find the best one for my daughter’s high arch. Without training, injuries would have knocked us out in the first 10 miles. As we trained, we found that we could only run five miles an hour. We were able to go longer, but never faster. Our trainer suggested we run with leg weights. We still ran five miles an hour (but we did get blisters from the weights rubbing on our ankles). A few sessions from a personal trainer would be a good idea if you could swing it. We found a great one who helped us gain some overall strength. We were able to fit in 10 sessions. It wasn’t much but it helped a lot and improved our confidence. I also suggest buying those power jellybeans at the Expo. A runner I met said that when you start to feel like you can’t go anymore, it means your sugar is dropping, so you need a boost. He was right. When I got to mile 8, I started to feel like I needed a rest, maybe even a nap. I ate a pack and in about 20 minutes I was feeling pretty good. (They give out power jellybeans at two stops but you may need some in between.) They also give out bananas, which we thought would be too heavy to eat and run, but we were burning a lot of calories and they went down easy. We also wore “throw away” clothes. It was rather chilly and we spent 50 minutes after the official race start in our corral waiting for our turn to start plus the time on the monorail and walking the mile or so to the start line. Yes, it’s a long walk. They should count that as part of the marathon. We had dollar store hats and gloves and my husband’s old long sleeve tees and jogging pants. There was quite an assortment of clothing left on the side of the roads. We were happy, though, that it was chilly. We trained in New Jersey and as the weather got colder, our runs felt easier without the heat zapping all our energy. We also made tank tops. Mine said, “running with my daughter” and hers said, “running with my mom.” On the back they said, “We need to find an easier Mother-Daughter activity.” As people passed us, (and lots did) we heard lots of laughter and got hundreds of comments — some people even took pictures. That’s all I suggest for costumes. You’re running 26.2 miles. That’s pretty far to be in a cumbersome outfit. We did see a poor guy whose wife or girlfriend dressed him as a seahorse and she was Ariel. We figured he must have been really in love. If you have any friends or family members who will be cheering you on at some point, tell them to bring you dry socks. I wore good socks but after 20 miles, they started slipping and I ended up with a blister on the bottom of my toe. If it’s hot, you may want them to bring you a dry shirt, too. That blister was my only injury. My daughter had one on the back of her foot even after adjusting her laces several times. As far as injuries go, I was very lucky, especially since I fell at mile 4-1/2. The course narrows at several places. When we were running under the tunnel at the Contemporary I got cut off from my daughter by a lady who then decided to walk. I tried to go around but the pavement was uneven and down I went. I saw two other runners go down along the way also so be careful, especially in the beginning as it’s dark out and those potholes are not your friends. Lastly, take a few stops along the way. It’s Disney. They have characters out that you normally don’t see in the parks. Lines may look long, but they move quickly and you’ll need a few breaks anyway. There are plenty of drink stations and medical stations. We walked through each drink station, grabbing the first PowerAde cup and tossing it in the trash at the end of the water line. 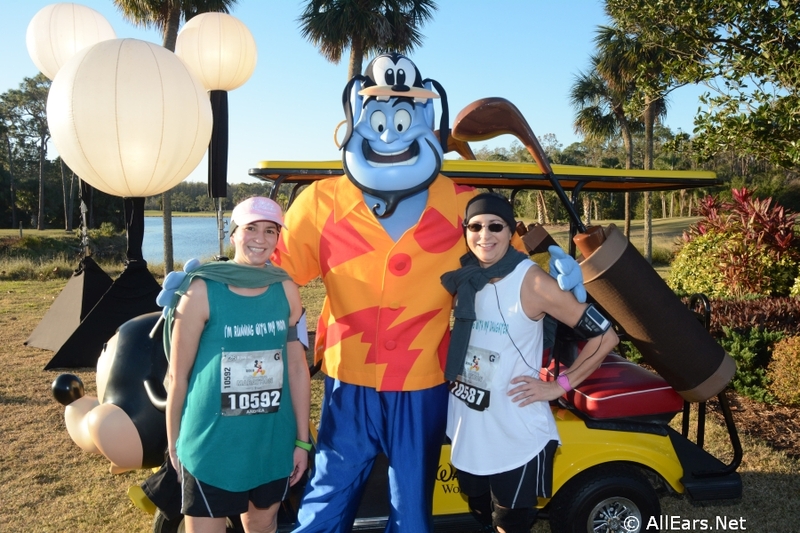 There are cast members, volunteers and spectators who cheer you on along the way. Some spectators hand out candy or cookies and others hold up all kinds of signs. Some of them are quite funny. In Epcot we saw cast members from each country cheering us on and several of the runners bought beer and pretzels in Germany. That was probably the funniest thing I saw in all the 26 miles. Some runners even rode the Tower of Terror in Hollywood Studios or Everest in Animal Kingdom. That’s where that big head start would have come in handy. 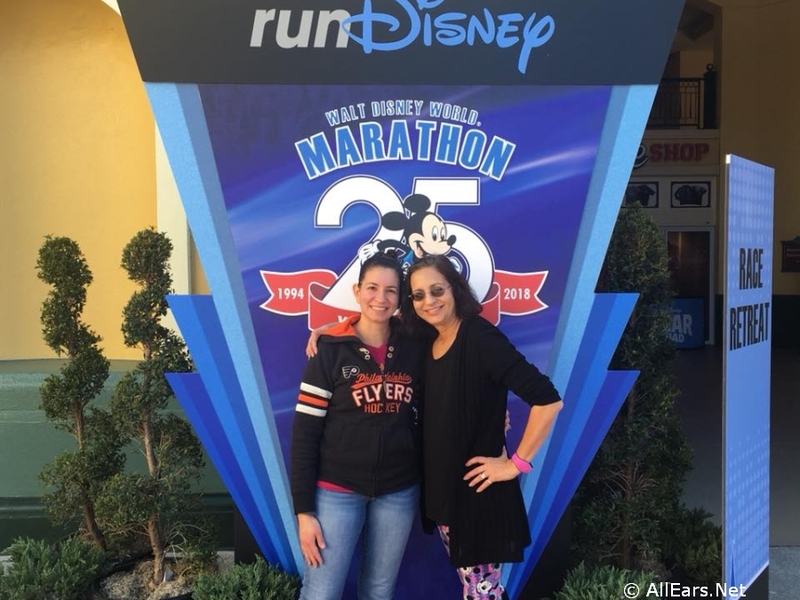 Running a marathon was not only something that I was able to check off my bucket list, but something that I was able to accomplish with my daughter. The person who initially went on record saying it was a bad idea was also the person who kept pushing me when I hit mile 22 and didn’t think I could go any further. By mile 24 I felt like I was running sideways. But there were so many spectators cheering for us that it kept me going. I found myself repeating whatever they were saying. “You can do it.” “You’re almost there.” “You got this.” Thank goodness no one yelled to give it up. Memories like these make running the marathon so much more than just a check off the bucket list. We have great photos and great memories especially once we were able to walk up and down steps again. We stayed at Bay Lake Tower so we limped over to California Grill for our reservation that night and drank a bottle of wine with dinner to celebrate. It was there that we decided whatever our next mother-daughter activity would be, it would involve sitting and sipping wine! Sandi Lamborne is a retired teacher who lives in Florida, but spends a lot of time in New Jersey with her daughter helping out with her children. She is not a runner but likes to pretend she is.